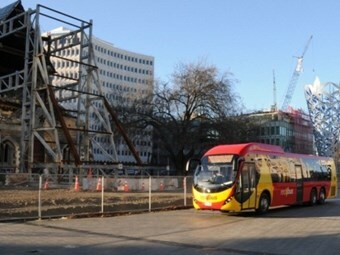 A year after earthquakes rocked New Zealand’s Christchurch, route service operator Red Bus has joined Canterbury Museum to run earthquake tours around affected parts of the city. Redbus was affected by the quakes, with its depot destroyed during the first wave of seismic events in September 2010. With the city under reconstruction and coming back to life, the ‘Red Zone’ tour drives through the cordoned-off central city area to see close-up changes to the city and its iconic buildings. A Canterbury Museum guide provides commentary on key points of interest, including insights into the impact of the earthquakes and the city’s recovery plan. On board video screens display historical and central city images. Red Bus Chief Executive Officer Paul McNoe says the tours are designed to be informative. "Red Bus offers visitors and residents this opportunity to travel through the cordoned-off area and give them an overall picture of these events and an insight into the city’s recovery," he says. The tours are proving popular, with additional services being introduced at weekends. The take about 45 minutes, runs seven days a week between 10am and 1pm weekdays and 10am to 3pm on weekends, and cost NZ $15. Tours leave from Rolleston Avenue outside Canterbury Museum, and bookings through www.redbus.co.nz are essential.